Women remain the custodians of mores and conventions in family life today. The weight of responsibility reposed in women remains enormous. In today’s world, a lot is even more expected as women have also become employers/providers of labour, contributing heavily to the family spend and income. In spite of the onerous responsibilities, so many other issues still prevent women from attaining the best that they can be. Some of these issues border on health and the way authorities have allowed many health facilities to go to rot. Infant mortality, maternal mortality, inadequate healthcare facilities, incompetence, corruption – these among others are issues that women have to battle with every day on their way to becoming what they should be. Some never get there and lose their lives on the table. Nkechi got married at 38 to a man of her dreams. Finally after many months of preparedness, she equips her nursery and her loving husband, on his birthday, takes her to the hospital to be delivered of the child she so hankered after. The child is brought home but Nkechi never lived to hold the baby in her hands. Right there with fibroid complications, Nkechi gives up the ghost and her son, now 2 years old, learns to cope with different caregivers and a father who experiences bittersweet emotions every time his birthday comes around. Hers is just one of the many cases that remain unsung. Her family is still grieving with telling reminders of the tragedy that easily could have been averted. According to UNICEF, out of over 6 million births in 2008 in Nigeria, One million and Seventy Seven thousand (1,077,000) babies died before age 5. Maternal mortality is put at 1 (one) in every 18 (eighteen) births. This is an astronomical projection that does not bode well. Analysts have stated that poverty is the major reason for this mortality rate. It is what drives families to quacks or unqualified doctors without knowledge of how to preserve human life. ‘Poverty exists when people lack the means to satisfy their basic needs’ and this is driving many women closer to their graves. Also, poor access to and utilization of quality reproductive health services contribute significantly to the high maternal mortality level in Nigeria. According to the 2003 Nigeria Demographic and Health Survey, 30 percent of Nigerian women cited the problem of getting money for treatment, while 24 percent cited the problems of accessibility to health facilities and transportation. Also, 17 percent reported the problem of not getting a female provider in the hospital, while 14 percent reported the problem of not wanting to go alone. Again, 14 percent reported the problem of ignorance of where to go for treatment, while one in ten women complained of the bottlenecks in getting permission from their spouses. The entry of Sweet Mother International, a Non-Governmental Organisation, with headquarters in Australia, into this terrain, is so heart-warming and welcome. Across the world, SMI has intervened and contributed immensely to the lessening of the many circumstances resulting in aggravations for women. With objectives to assist displaced or refugee mothers affected by war or disaster, Sweet Mother International (SMI) provides volunteer services and provision of relief materials. SMI has instituted the SAVE campaign in Nigeria. 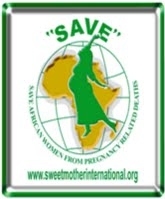 The SAVE campaign is actually focused on saving African Women from Pregnancy Related Deaths. 1. To organize rallies, media campaigns, TV Talk Shows in order to highlight the plight of women in Africa, particularly, the avoidable deaths of women from treatable pregnancy complications. 2. To call on governments and stakeholders to intervene in reducing maternal mortality rates in Africa; particularly, to call on African governments to provide free obstetrics care for women. 3. To mobilise support, donations and care for rural women in Africa, including visits to obstetrics hospitals to show love to new and expectant mothers. 4. To establish a Trust Fund to assist rural women with obstetrics care. To achieve this, SMI will be collaborating with governments and stakeholders to provide a free and efficient obstetrics care to rural women in Africa. In Africa, many families are poor and cannot afford caesarean operations in time of pregnancy breach; having free obstetrics care will invariable save hundreds of rural women. 5. Establish a Mobile Maternal Health Unit (MMHU) that will visit rural communities to assess the health conditions of pregnant women, with a view to identifying at the earlier stages of pregnancy, women at risk of developing complications during childbirth. The MMHU comprises an ambulance equipped with obstetrics equipments (Ultra Sound machines etc) and medical personnel. 6. Establish an Obstetrics Emergency Intervention Unit (OEIU) that will rescue women experiencing complications from rural communities to a nearest obstetrics hospital. The OEIU comprises an ambulance or medic helicopters fitted with obstetrics equipments and manned by trained obstetricians and midwifes. Already SAVE rallies have taken off in many parts of Nigeria. Lagos, Niger, Ekiti, Osun, Oyo, Kwara and several other cities that the SMI Organisation has found willing and committed volunteers. Enlightenment has also been identified as a key component of this campaign. In doing that it has been decided that a series of radio and tv campaigns would do well to properly position the issues before the people and government, in order to ensure that some attention is paid to the health sector with a specific bent towards addressing the causes of maternal mortality and tackling them head on. Towards the achievement of the above short and long term objectives, the SMI has decided to implement a Sweet Mother Radio and TV series across the federation. Click here to read more about SMI Nigeria.